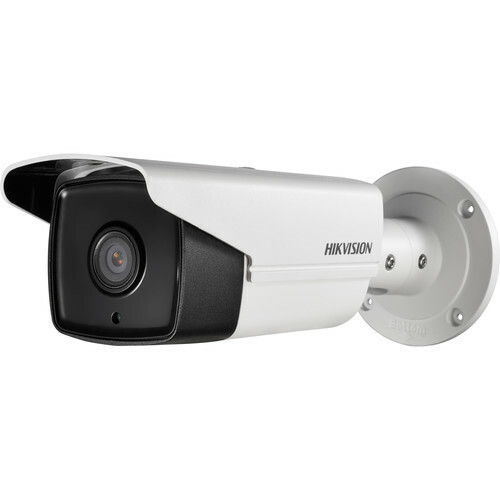 The DS-2CD2T22WD-I5 2MP Outdoor Network Bullet Camera with 6mm Lens & Night Vision from Hikvision has a 2MP 1/2.8" progressive scan CMOS sensor to capture 1920 x 1080 resolution video at 30 fps. The 6mm fixed lens features a 54° field of view. EXIR technology delivers up to 165' of night vision. Integrated PoE technology allows data and power to be transmitted over one cable. This device is ONVIF-compliant for Profiles S and G, making it compatible with a wide range of surveillance products. Additionally, this device is housed in an IP67-rated enclosure that is suitable for outdoor use. Box Dimensions (LxWxH) 15.25 x 6.35 x 6.3"